French Emblems: Emblem: Veneris potentia. Caelum, & Iovi dat iura. quid papavera? Mala? illices esse has voluptates puta. Venus, why do you carry a pole [of heaven] on your head? - My power climbs to heaven, and gives laws to Jupiter. - Why a poppy? - I lull the hearts of men to sleep, however ferocious they are. - For what purpose the dewy Apples? - Think of these as the seductive delights. Heroicum comitatum Iambico senatio [=senario] . Te sequitur cupidè, quó quamque inducere pergis. Efficis, ut cupidè generatim saecla propagent. columbas deputant: Sappho etiam passeres dat. bile percitos furiososque ad sanam mentem revocat. Follows you with desire, whithersoever you lead. Venus should be portrayed naked, crowned with myrtle, accompanied by the boy Cupid who is winged, blind, armed with quiver and bow, holding a golden apple in his left hand and poppies in his left. 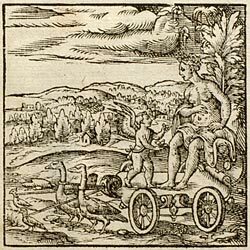 In addition one could add a chariot drawn by two swans and an equal number of doves, on which Venus would be seated: for Horace, Statius and Ovid say that swans carry her, and others assign this role to doves; Sappho even gives it to sparrows. Meanwhile everyone knows the particular power of the poppy to lull one and bring on sleep, to such an extent that an over-use of it even brings on an insuperable urge for sleep and a drowsiness. But Venus, when kept within bounds, lulls implacable wraths and relaxes one, as we are told by Aëtius and Aegineta; she takes away sadness from the mind, restores calm to the soul, and beckons those who are stirred up by rage, and who are furious, back to a state of sanity. 1. The pole represents the pole or axis of heaven. The prose explains that this is inspired by an ancient statue of Venus; in this the poppy and apples were carried in Venus’ hands, not on her head; however in the engraving it is Cupid who carries them. The pole of heaven seems to have been left to the imagination. 2. Titus Lucretius Carus, Roman poet and philosopher (d. 55 BC). 3. A curious mish-mash, related to De Rerum Natura, 1.1-2, 4, 15-16. 4. Aëtius Amidenus (of Amida), physician to Justinian I (6th century), compiler of the medical knowledge of late antiquity. Paulus Aegineta (Paul of Aegina), Greek physician, probably 7th century. 5. Atra bilis: black bile (can mean ‘melancholy’, but also, as in Greek, ‘rage’ or ‘fury’).